One of the earliest accurate maps of Alaska and Bering Strait. This is an exceptionally fine example of John Thomson's 1814 map of the Bearing Strait. Centered on the Bearing Strait, Thomson's map covers from the coast of California to Alaska and the Arctic Sea, and the coast of Asia from The Kurile Islands and Kamchatka to Shelatskoi Noss and the Bear Islands. The Aleutian Islands, here identified as the Fox Islands, Andreanovskik Islands and Aleoutskie Islands, are also included. The whole is beautifully engraved in the minimalist English style pioneered in the early part of the 19th century. Relief is shown by hachure with towns, cities, and major topographical features identified. Thomson issued this map in 1816 and it is one of the earliest maps to accurately depict the region. Though ostensibly drawn to illustrate the excursions of Captain James Cook – the tracks of his voyage are evident throughout – the discoveries of later voyages by Bering, Perouse, and Vancouver are also clearly in evidence. These include Vancouver's remarkable mapping of the northwest coast between Washington and Alaska, and Bering's detailed mapping of Kamchatka and the Asian side of the Bering Strait. Around 71 degrees north latitude Thomson includes the note 'The further progress of ships northward was rendered impossible by the ice extending from continent to continent.' Despite this he maps a speculative northern Alaskan coastline connecting the Bering Strait to the northern sea discovered by Alexander MacKenzie in 1789. He further maps the MacKenzie River, named after the erstwhile explorer, and indicates its course as far inland as Great Slave Lake. The establishment of an outpost on Whale Island, at the mouth of the MacKenzie River, is also noted. 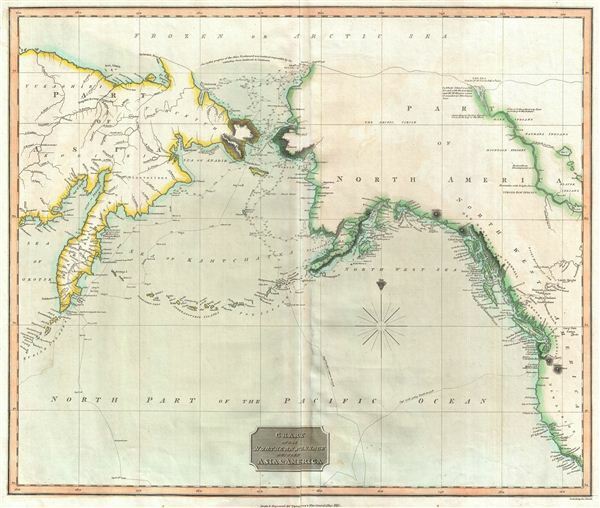 Thomson's mapping of the speculative coast line between the Bering Straits and the Whale Island Post, taunts readers with the possibility of an Arctic trade route from the interior of British North America to Asia. Such a route would be highly profitable for the Hudson Bay Company and its subsidiary the Northwest Company in transporting their beaver pelts to the lucrative markets in China. Around the same time this map was published, a similar, American outpost, named Fort Astoria, was established by John Jacob Astor's American Fur Company on the Columbia River. Though not named here, Fort Astoria was the first American outpost on the western coast of the continent and led to conflicts with Britain over territorial claims and trading rights in the region. This map is a steel plate engraving by Scott Robert and was prepared by John Thomson for inclusion in the 1816 edition of Thomson's New General Atlas. Very good condition. Original centerfold exhibits some moderate toning and archival verso reinforcement. Light soiling to outer margins. Some offsetting or transference. Original platemark visible. Blank on verso. Phillips (Atlases) 731. Newberry Library: Ayer 135 T4 1817.